he Serwotka DWP offensive in July was a great success as anyone could see looking at the cheery faces of our members, unlike those of the management kapos, when we returned to our trenches after the two-day push. For months Management have been trying to spread despondency by stating that the sweeping 100,000-odd cuts were inevitable, that the Government was prepared to stand firm for years, and that all resistance was futile. Now they realise that attrition works both ways and not always in their favour. General Haig, often described as the architect of attrition, though not its originator, is often misunderstood. Wars are not won simply by killing more of the enemy than they kill of yours. Victory comes to those who hold their nerve. And that is what happened in 1918 when Germany cracked and begged for an armistice even though the Central Powers had inflicted more losses on the Allies than they had endured. Members next go over the top in October and morale is high. The DWP GEC has told the FDA mandarins to get stuffed (prop. JONATHAN BORE late of CPSA) and LUNITY High Command is keeping its nerve. They’ve given a measured response to defend CHARLIE McDONALD – up on a disciplinary for bollocking a scab who had the nerve to approach him for advice – though the CARCASE are going to town on it, despite getting their fingers burnt over the CHRIS FRAUD affair. But meanwhile far from the front the dismal johnnies are ready to put up the WHITE FLAG at a moments notice. STUART “peace at any price” CURRIE is trying to outflank the ANTI-BUNTERITES who defected to LEGS PRIESTLEY in June by touting for a voluntary redundancy and early retirement deal, which would be fine, if there was the slightest chance of the employer accepting it. Unfortunately for FATKINS there isn’t a hope in hell and he knows it. The BUNTER appeal that appeared on his website has been studiously ignored by the ANTI-BUNTERITE coalition who are wisely keeping their heads down on the cuts, confining themselves to sniping over the entirely predictable FALCONCREST re-organisation that has strengthened the hold of LUNITY and LORD UNDY on the union apparatus. Howls of rage at GRAHAM STEEL’S redeployment and the new fulltimer appointments are largely theatrical. STEEL knew he was going to be kicked out of the new IR/Customs group when he lost his bid for DGS. He’s not lost any money or status, only his old fiefdom, which he hoped to milk for votes when he challenges MAREK for the top job next year. Giving FRANK CAMPBELL, a former BL’84 stalwart, the job was a foregone conclusion and to give him his due, CRUMBLE is an able officer who is too near retirement now to have any further political ambitions. The elevation of LUNITY’S TOM TAYLOR and STELLA DENNIS, together with top Underling STEVE COMER is hardly surprising. All full-timers are useless but some are more useless than others as BARRY’S crop proved in the past, not to mention the army of useless high-caste bureaucrats promoted when the SOCIETY was in SECRET LEFT hands. They are always the gift of the dominant factions and these three all have long track records of solid if uninspiring work for the union. The miserable sniping in the rear is motivated simply by jealousy and greed. But STELLA’S promotion does present some problems for LUNITY. She had long been tipped to stand in as President when JANICE steps down under rule, as the person likeliest to bag the women’s vote. Now LEON BAUGH and his comrades will have to find someone who can best stave off the MAD MONK’S challenge. DANNY WILLIAMSON, the RED answer to MARTIN BOYLE, would be an obvious choice it is wasn’t for the fact that the SSP bruiser is simply unelectable. A lot of serious thinking is going to take place in the next few months. Meanwhile LEGS has got other things on his mind like finding a name for his new united faction and drawing up a manifesto than can appeal beyond the Revenue faithful and the former Moderati. His hip operations have forced him to rely more and more on his chief henchman, JAKE the RAKE, whose concentration has been diverted by amorous London adventures with a LEEDS secretary and making a risible bid for the job earmarked for STELLA. Meanwhile our friends in the North tell us that CAWKWELL has got away with a severe but unofficial bollocking over his Conference behaviour, mainly because the SCOUSE organiser that was the focus of his unwelcome attentions is on her way out anyway as she is utterly useless. They also say that the Geordies’ gain is Yorkshire’s loss because BERNIE WILLIAMS is now house hunting in the posh area of LEEDS on his pay-off money because his wife works at IR Shipley. BERNIE, incidentally, also falls into the utterly useless category. DAVE (more Marxist than Karl) MITCHELL of the HOME OFFICE GEC seems to have lost the confidence of his comrades; in a recent branch bye-election to elect a new branch secretary for the YORKSHIRE AND NORTH EAST branch, he polled last place with a miserly 32 votes. The winner was WINSTON DAWES with a massive 82 votes. Clearly. the Revolution isn’t going to start with the masses rising up and singing Ilkla Moor baht at, unless the YORKSHIRE SOVIET can be revived. Conference Hero, mild mannered STAN STENNETT (see http://www.pflcpsa.com/conf%202004/wednesday.htm ) has made history; the report above mentions that he had refused to partake of PDS, and as a line manager, was suspended without pay and denied representation. The PCS legal victory was achieved on 10 August 2004 at the London South Employment Tribunal hearing of Stennett -v- DWP with representation provided by PCS. The unanimous decision of the Tribunal supported the complaint made under section 10 of the Employment Relations Act 1999 and awarded the sum of £540 (representing two weeks pay at the current statutory maximum) as compensation for being denied the right to be accompanied. The Tribunal decision does not mean that recent TRDs count as a disciplinary penalty under DWP Disciplinary Procedures. It does mean the right to be accompanied should not be denied. The industrious STAN spent his enforced time off redecorating his kitchen and jogging, thus preserving his annual leave for saving the world and err…jogging. 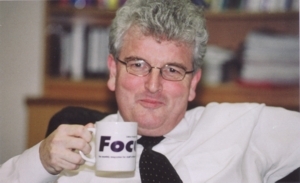 New Immigration Minister Des 'Swiss Tony' Browne falls victim to a PFL agent when on his first day in office he proudly displays the new Home Office PFL mug, issued to commemorate the first word uttered by Bev Hughes when news of the Steve Moxton affair broke.